Anyhoo, that picture depicts the amber trap. 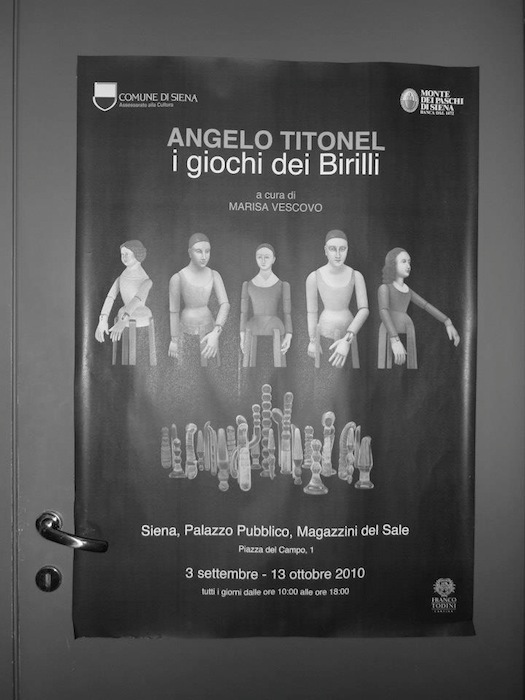 Here’s another snap of a poster I found near the bathroom of a Sienese museum devoted to the city’s history. While, at first glance, it might seem to disprove my thesis — how modern! marionettes & dildos! — I ask that you consider this picture more deeply: where else on earth could such a poster exist but in a country in denial about a modern consciousness rife as it is with irony, sarcasm, parody, self-parody, all the rest of it. 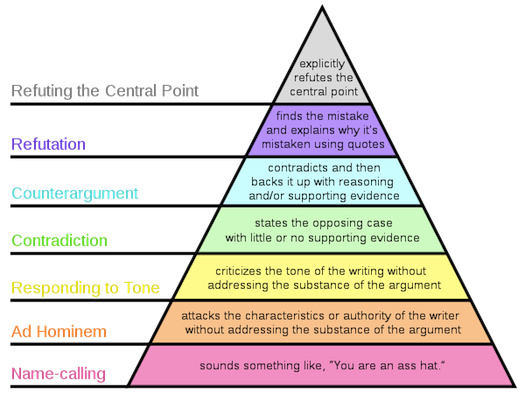 I can explain to you why I like Paul Graham via close reading, but maybe it’s better and easier to show you this diagram grabbed from Wikipedia which someone came up with to illustrate Graham’s essay How to Disagree. 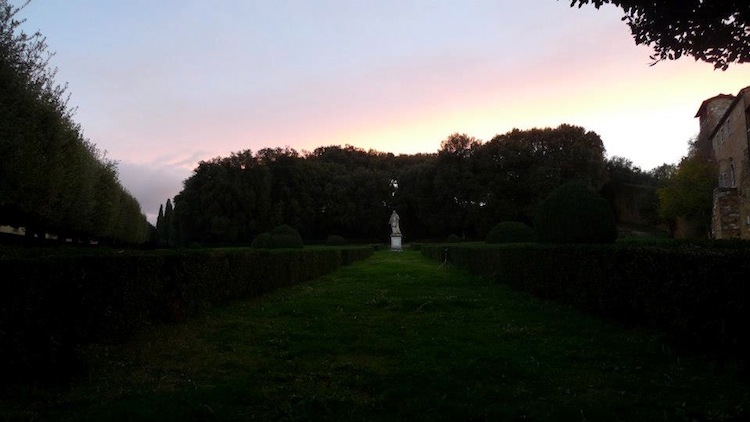 In any case, to tie tight the two strands of this blog post together, my recent visit to Italy got me thinking a bit about one essay of Graham’s, which provides his take on the amber trapped era Italians look back upon with such justifiable pride. Good design happens in chunks. The inhabitants of fifteenth century Florence included Brunelleschi, Ghiberti, Donatello, Masaccio, Filippo Lippi, Fra Angelico, Verrocchio, Botticelli, Leonardo, and Michelangelo. Milan at the time was as big as Florence. How many fifteenth century Milanese artists can you name? Something was happening in Florence in the fifteenth century. And it can’t have been genetic, because it isn’t happening now. You have to assume that whatever inborn ability Leonardo and Michelangelo had, there were people born in Milan with just as much. What happened to the Milanese Leonardo? There are roughly a thousand times as many people alive in the US right now as lived in Florence during the fifteenth century. A thousand Leonardos and a thousand Michelangelos walk among us. If DNA ruled, we should be greeted daily by artistic marvels. We aren’t, and the reason is that to make Leonardo you need more than his innate ability. You also need Florence in 1450. Nothing is more powerful than a community of talented people working on related problems. Genes count for little by comparison: being a genetic Leonardo was not enough to compensate for having been born near Milan instead of Florence. Today we move around more, but great work still comes disproportionally from a few hotspots: the Bauhaus, the Manhattan Project, The New Yorker, Lockheed’s Skunk Works, Xerox Parc. This also made me wonder about ambition vs. skill vs. luck as it plays out among the scene I find myself part of, the certainly more modest achievements of the Brooklyn, New York art scene — filled as it is with musicians, graphic designers and artisanal chocolate makers. 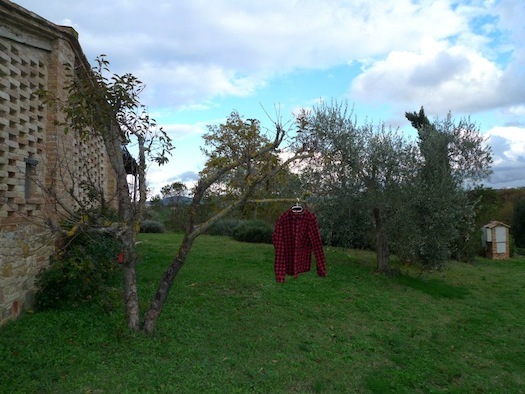 However, self-consciousness befits an essayist more than it does a cultural producer, so for now I’ll hang up my flannel on that question, and relive a moment of staring out over the crete senesi. What philosophy books would you recommend? I can’t think of any I’d recommend. What I learned from trying to study philosophy is that the place to look is in other fields. If you understand math or history or aeronautical engineering very well, the most abstract of the things you know are what philosophy is supposed to be teaching. Books on philosophy per se are either highly technical stuff that doesn’t matter much, or vague concatenations of abstractions their own authors didn’t fully understand (e.g. Hegel). It can be interesting to study ancient philosophy, but more as a kind of accident report than to teach you anything useful. Seriously though, whenever this Paul Graham (not this Paul Graham) publishes one of his essays or talks on his website, I am riveted. Clear-eyed, elegant, and thoroughly thru-conceived thought & documentation on topics ranging from the death of television to the lies we tell our kids from an artful computer programmer’s perspective. He seems to be posting less frequently of late. That bums me out.